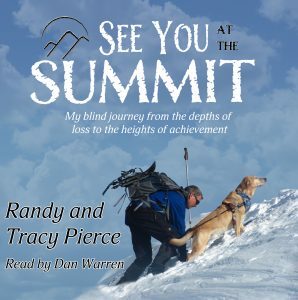 Since going blind, I’ve delighted in the development of the audio book as a means to provide tremendous quality access to a pastime and passion I so well appreciate. It was always a goal of mine to ensure that our book was available in paperback, electronic format, and ultimately audio versions for exactly this reason. The real challenge was in how to create an audio book. Many have suggested I should be the reader for this book by virtue of my voice and the obvious fact it is my life story. I appreciate both the compliment and confidence, but for many reasons we felt this project was best left in the hands, voices, and audio edit work of the professionals. Dan Warren is that professional and we are proud to have him reading our tale for all of you. There is a lot involved in this creation and for the nearly 11 hours of reading ahead, you can believe that many more hours were invested in production. Along the way I’ve had the opportunity to listen to Dan read individual chapters and eventually the entire book a couple of times. Each time, he took me on the same journey of laughing, tearing up, and thinking which I would have doubted was still possible after having written the material and immersed so frequently into it for writing edits and then audio edit. He does the work justice and as the Amazon reviews (hint, hint!) continue to suggest, I think you will also find a similar journey if you choose to join us for the journey! I hope to “See You At The Summit”! I recommend the audio book as inspiration to everyone.